If you were to visit the Petrie Museum with infrared vision, you would probably be drawn to wildly different parts of the collection than you would normally. Certain artefacts would appear to glow before your eyes. This is because of the inventively-named pigment Egyptian blue, which, as the name tells you, is a blue pigment that was commonly used in Egypt. However, Egyptian blue has a special property that makes it stand out from the rest: when illuminated in visible light, it fluoresces infrared light. If you could see infrared light, you would see all of the artefacts that contain this pigment glowing. I haven’t yet evolved to have this special power, but I have a camera that does. This is a multispectral imaging system and is what my PhD research is focused on. Multispectral imaging involves capturing images of objects that are illuminated in ultraviolet, visible and infrared light to reveal features that cannot be detected by the human eye alone. 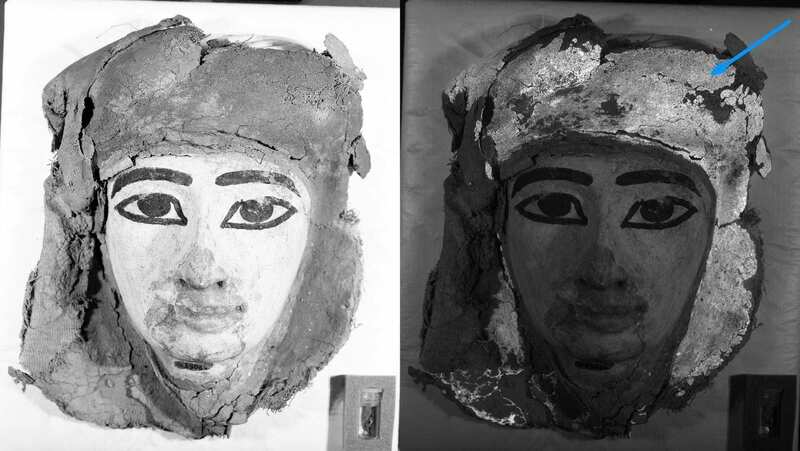 Last November, I captured multispectral images of this Egyptian mummy mask from the Petrie Museum. In the Petrie catalogue, it is described as a “linen-based cartonnage mask, painted with blue headcloth, white face, black brows, eye-borders and pupils, and red-edged yellow band around face.” This mummy mask would have placed over the mummified body to protect the deceased in the afterlife. 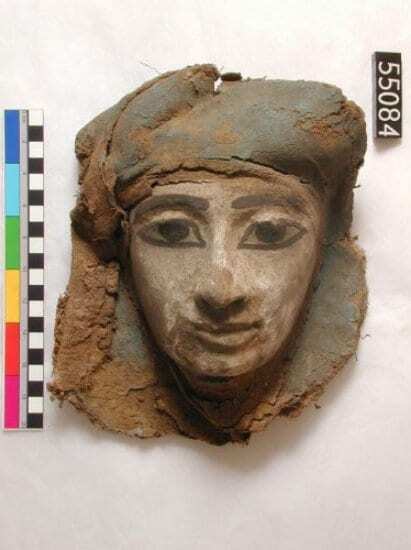 The Petrie has several mummy masks in the collection, including some that are gilded with gold. The mask was illuminated in visible light and an infrared filter was placed in front of the camera lens. This meant that only infrared light was able to pass through the lens and be captured by the camera. The resulting image is below. The blue headcloth appears brightly in the image, indicating that it is painted in Egyptian blue. We were also able to confirm that the little fragment of mask in the vial was also from the headpiece, as this also fluoresced. When you search Egyptian blue in the Petrie catalogue, 194 results appear ranging from Egyptian blue scarab beetles to plaster with hieroglyphs written in Egyptian blue paint. Two of my favourite items from the collection are the Egyptian blue hippopotamus and the Egyptian blue paste amulet of a lion-headed goddess. The hippopotamus represents Taweret, the Ancient Egyptian goddess of childbirth and fertility. The lion-headed goddess is probably Bastet, the goddess of warfare in Lower Egypt . Left, hippopotamus in Egyptian blue pigment (Petrie Museum, 6489) and right, Egyptian blue paste lion-headed amulet (Petrie Museum, 52875). Next time you visit an Egyptian museum, keep your eyes out for any artefacts that are painted in Egyptian Blue that are glowing unbeknown to your eyes!